Estimates the volume of liquid plaster needed to make a two part casting mold, based on the calculated volume of your model and container (ie. the cottles used to surround the model being molded). Just want to make drape mold by filling a container with plaster. More info on how to calculate plaster volume below. *Use length and width for rectangular shapes; Use radius for cylinders, spheres, cones. Enter model and container measurements in inches. 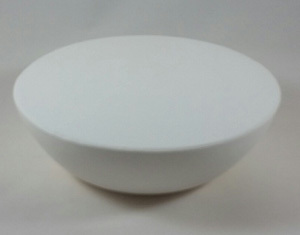 Half sphere can be used if your model is a bowl and is approximately half the size of a full sphere. Currently, both the container and model fields are required since it's assumed you are making a casting mold. However, if you just want to determine the volume for making a drape mold, you can do the following: fill in all the fields for the model on the form. Because you need to fill in the container fields, just enter values that are larger than the model. Then, refer to the calculated model volume, which will be the approximate amount of plaster slurry in cubic inches required to make your hump mold.